A skilled naturalist and prolific writer, R.M. Lockley (1903-2000) wrote more than 50 books, many of them about the wildlife of the British Isles. While recovering from injuries suffered while on service during the Second World War, he discovered, on a secluded beach at the base of a cliff on a remote part of the Welsh coast, a breeding colony of harbor seals. A year later, with the war still underway, he sailed there in a curragh, beneath which, overturned, he camped for months while studying the seals' breeding habits. The Seals and the Curragh is Lockley's account of that idyll. 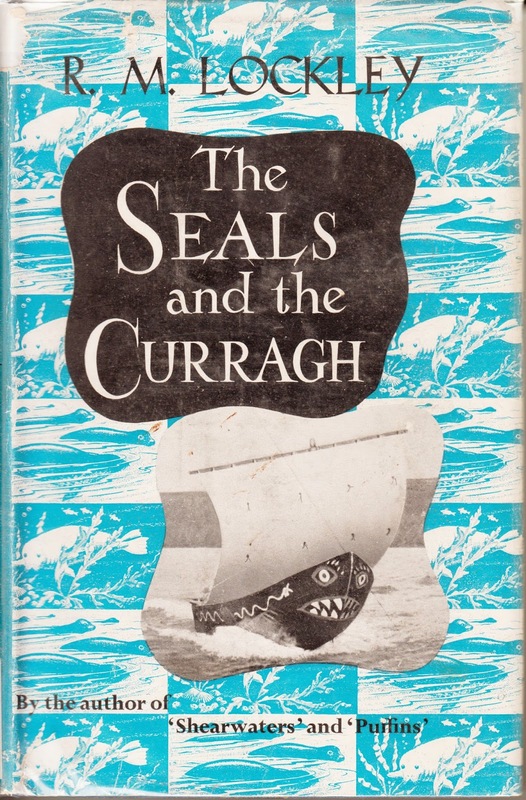 And though the curragh gets major billing in the title, it plays a minor role in the book, which concentrates more on the seals, on conservation, and on Lockley's charming relationship with Tessa, a 13-year-old girl, a refugee from London who lived in the home of a local Welsh farmer and who brought Lockley milk, helped him in his studies, and kept him company at his secluded campsite. This was a time when a man's intentions toward minors were assumed to be honorable (or, at least, those of men of a certain class), and Lockley's description of his innocent relationship with Tessa recalls what seems now a time of great naivete and purity (strange, that, during the most destructive war in history, describing a relationship between an injured soldier and a girl who had lost her mother to a German bomb and whose soldier father was presumed dead in Singapore). Giddy -- that's how the Irish describe a curragh in one natural word of caution; but it gave you a marvellous feeling to watch a Dingle or Blasket man handle one. Like a fleet-toed dancer the curragh skimmed over the white breaking currents, a living bird of the waves, safe in the skilled hands of the men of the Irish south-west. The Welsh fishermen had gasped at her long length of twenty-five feet and narrow beam of four feet with horror. 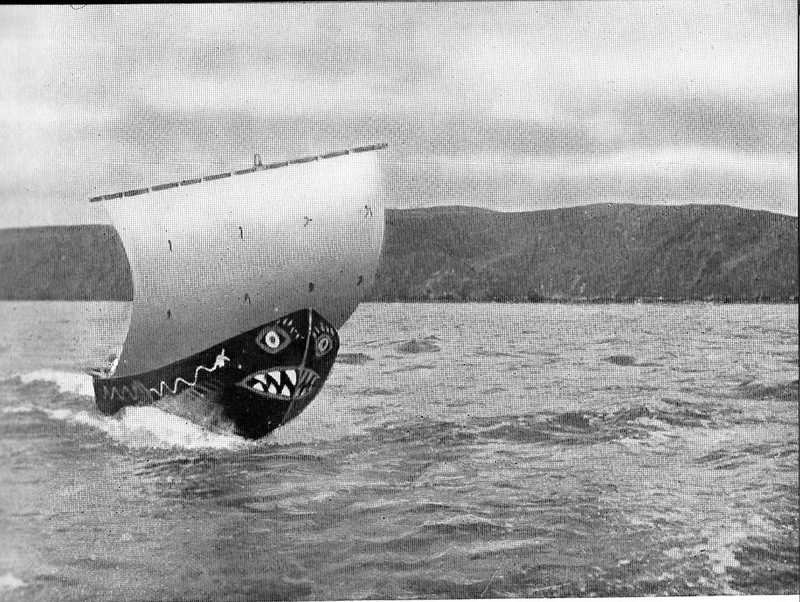 Nor had these men of the grey coast appreciated the smiling eye and shark teeth which I had painted each side of the bow, in the Iberian fashion, to give life to the black tarred hull. It was the evil eye to them; they were afraid of that which they could not understand. Lockley's extraordinarily painted curragh running before the wind. The lightweight boat appears to be on plane. Aside from this, we learn only a little about the boat itself: The tarred skin over its wooden framework was of canvas. It had a small lugsail which, in the book's only photo of the boat, is turned athwartships with its peak lowered almost to horizontal, a virtual squaresail for when the boat runs before the wind. Two sets of reef points are visible, but no forestay, and one suspects the absence of shrouds and backstay. There was a sloping transom, but no keel or other underwater plane. It had tholepins (single or double is not clear) for rowing. And steering was by means of a paddle held over the starboard quarter. It was capable of being easily rowed, dragged ashore, and overturned, all by one man, and it could carry some number of sheep between the mainland and islands off the coast. Judging by Lockley's description of sailing through a storm while alongshore, it was extremely seaworthy. Lockley and Tessa voyaging to a small island near the seal nursery to check on Lockley's sheep. Illustration by Lockley. Judging from swordfish remains recovered from some Moorehead Phase middens, it's clear that swordfish were an important food source. Swordfish are dangerous prey that can only be hunted from boats, but essentially no wood artifacts of any kind have been been recovered from Moorehead sites, and this means no boat remains. Numerous, beautifully-crafted stone adze and gouge blades have been found, however, in Red Paint cemeteries and dwelling sites, and it is most likely that the Red Paint People used dugout canoes. Rendering showing how a stone gouge might have been hafted. 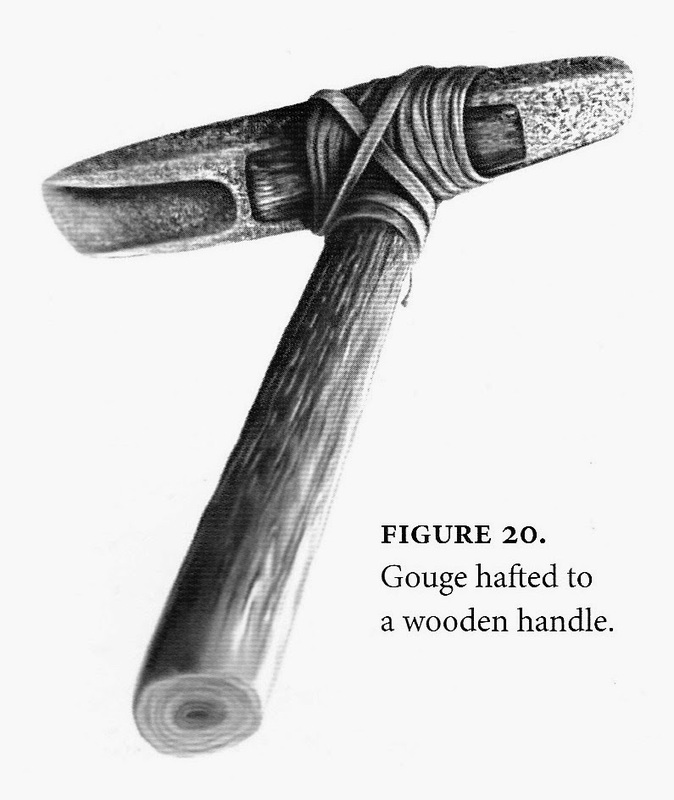 Gouges would have been efficient tools with which the Red Paint People might have hollowed dugout canoes. 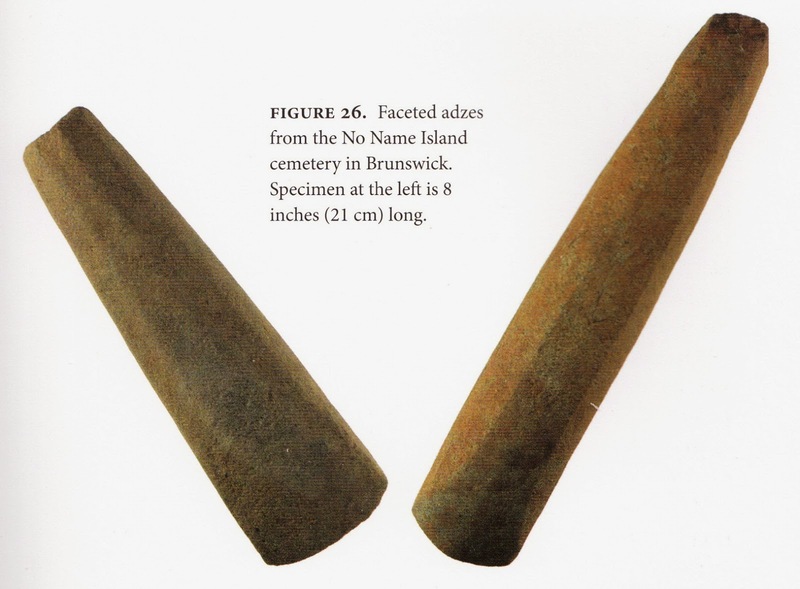 Bourque discounts the possibility that they used birchbark canoes due to the absence in the archaeological record of the microplanes and stone scrapers that would have been needed to form the framework, and bone awls used to sew the bark covering. (Indeed, there is little or no evidence for bark canoes in the Northeast much before European contact.) Skin boats, too, would have been unlikely, due to their very short lifespan in the temperate climate. 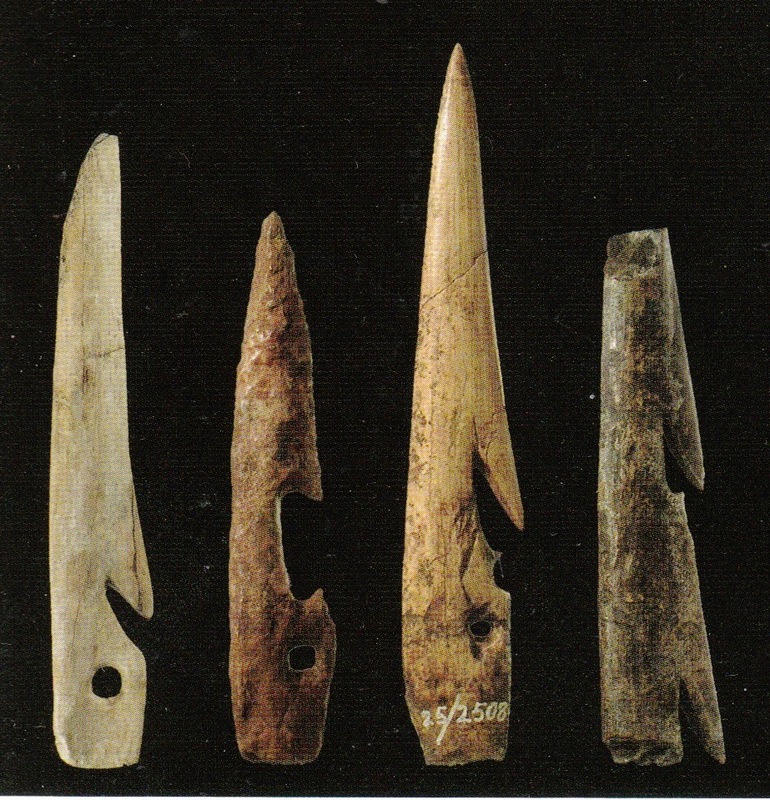 Bone harpoon heads from Red Paint sites in Maine. Largest one is a bit less than 4" long. The power of this high-status or powerful chief emerges from hunting dangerous animals in the sea. The cause-and-effect relationship between hunting prowess and wealth is difficult to work out, but there seems to be a link between risk taking and the ability to acquire the wealth, in labor and material, needed to build a boat and maintain it and provide for its crew. On the northwest coast [of North America], for example, "only chiefs command the resources to pay for a great canoe." Among the whale-hunting Nootka of Vancouver Island, British Columbia, "[w]haling was the noblest calling, and the whaler was always a chief." And among the Tareumiut, the coastal Inupiat of northern and northwestern Alaska, senior male family heads are called umialik, meaning "umiak captain," the umiak being a large boat used to hunt whales. While umialik have no chiefly power, the title implies a degree of wealth and enhanced status. Finally, among the Alutiiq people of Kodiak Island, though they hunted from small kayaks and lacked high status, whalers were deemed too powerful and dangerous to live or be buried among normal people. These examples of high-status boat builders, boat captains, and even solitary whale hunters among societies that pursue dangerous marine prey suggest that some similar situation prevailed among the Red Paint People as well. Stone pendants from Red Paint cemeteries. Bourque suggests that the crescent-shaped ones (largest: 4.7" wide) might have symbolized swordfish tails. Slate "bayonets" from a Red Paint cemetery; longest 16". These beautifully crafted artifacts are thin and fragile and almost certainly did not serve as weapons, although they may have symbolized weapons or, as Bourque suggests, the rostrums (swords) of swordfish -- or possibly both. The Swordfish Hunters is a nice mix of straight archaeology, personal narrative of Bourque's experience researching the topic, extrapolation of archaeological findings to broader ecological issues, and commentary on how diverse scientific disciplines can and should collaborate in uncommon ways. Normally, such a broad mixture of topics would result in an unfocused, of not confused, narrative, but Bourque pulls it off, leading from one topic to the next through smooth transitions and logical conclusions that make it an easy and thought-provoking book, especially for one that trends more toward "serious" than popular science. The Inuit people of Alaska's west and northwest coasts -- from Nome to Point Barrow -- hunted whales in umiaks from 1,800 BCE to well into the 20th century. Several villages located on prominent points of land along that coast supported large populations by virtue of their whaling economies. Hunting began each year in early April at the southern end of the range, and late April at the northern, when winds from the land started to open up leads in the ice. Bowheads were the first whale prey each year, although seals would be caught opportunistically during whaling excursions. Whole villages would cooperate by clearing a path through the jumble of grounded sea ice out to the lead. Crews of six men would then haul their umiaks out to the lead, to wait on the ice and watch for a whale. Larger villages might have as many as 15 such crews. 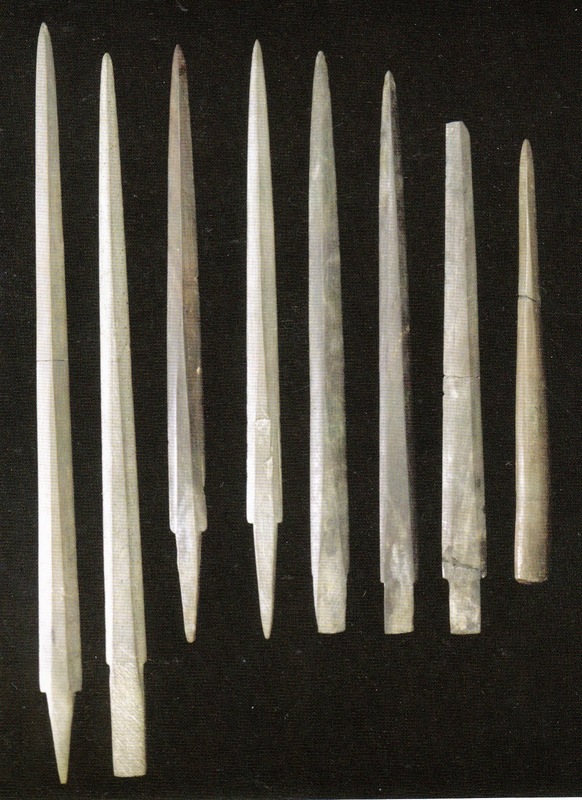 Harpoons with detachable foreshafts were traditionally tipped with flint heads, iron heads being taboo until the 1880s. The heads were attached by rawhide lines to two or three inflated sealskins, each with a buoyancy of 200-300 pounds. After a successful strike, these floats would slow the whale's escape, restrict its ability to sound, and allow the boat crew to follow its flight. After a struck whale tired and could again be approached closely, work with a ten- to twelve-foot-long, flint-tipped lance began. The lancer would first sever the tendons of the whale's flukes. This prevented it from sounding again and protected the boat and crew from the dangerous thrashing of the tail. Finally, the lancer would probe deep into the whale to make a killing stroke. The boat would retreat a bit until the final thrashing subsided. A snack break while butchering a whale, up to his waist in frigid water and warm whale carnage. The whale was then towed to shore (or as close as possible, given the landfast ice), with several umiaks assisting in the tow. 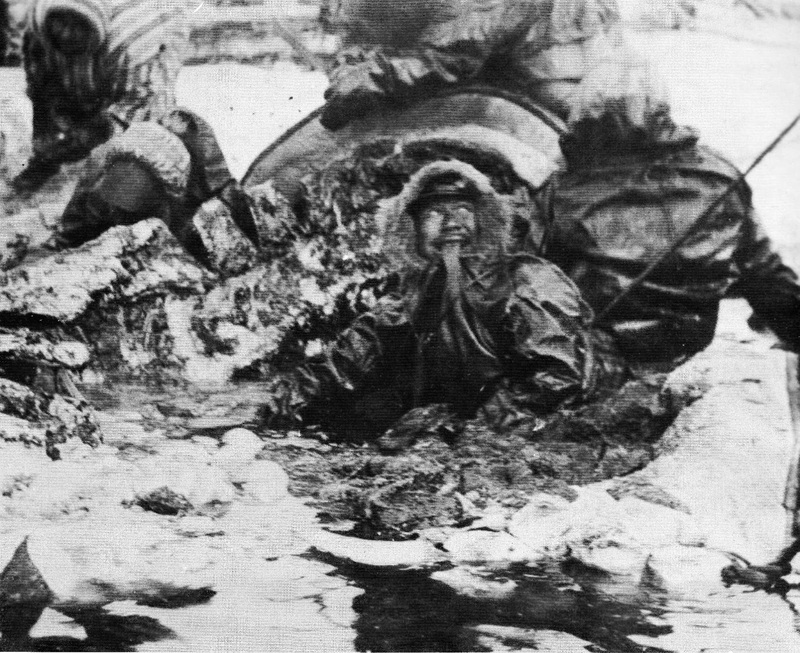 During butchering, men were often up to their necks in the frigid water, so they wore waterproof, sealskin suits that covered them from the feet to the head (a predecessor to the modern drysuit). A waterproof sealskin suit for butchering whales. Following a successful hunt, the community would feast on boiled whale meat, then store the rest in prepared ice cellars. After the initial feast, all parts were normally eaten raw. A 50-foot whale might yield 50 tons of meat which, along with the blubber, was divided equally throughout the community. Bone and baleen, however, were the property of the crews of all the boats within sight of the killing. 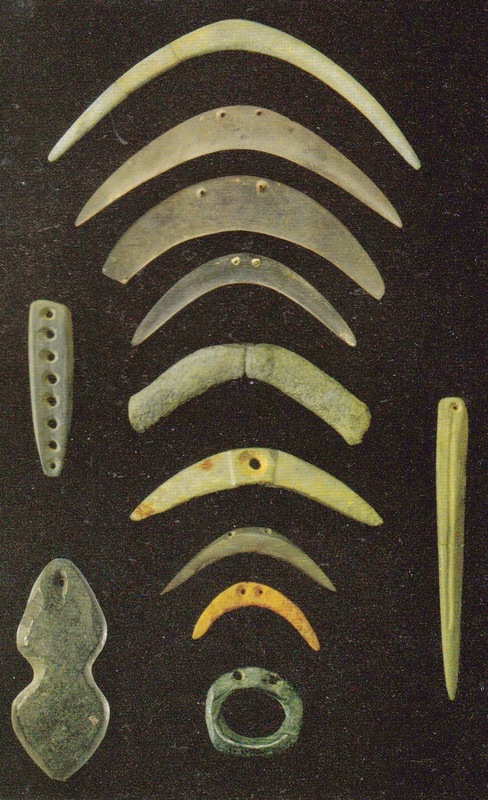 Amulets were fastened to the boats and to hunters' clothing, and the clothing itself had to be newly-sewn (by the women, of course) and never have been used for hunting other animals. 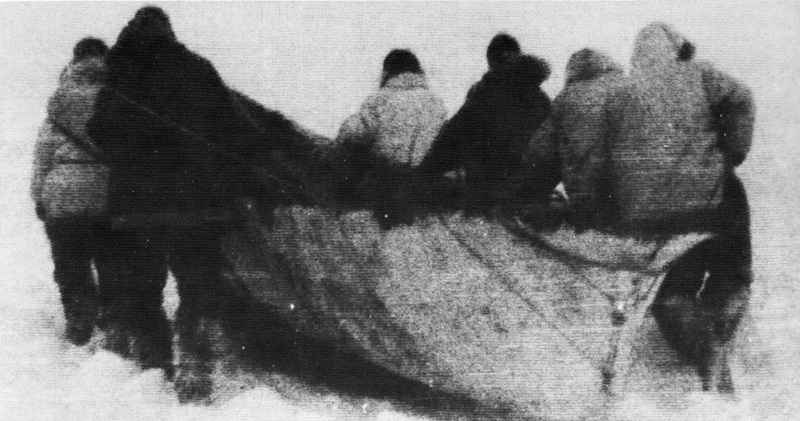 Outer clothing was scraped skin; the inner clothing had the fat still on it, providing extra insulation for the men while they waited on the ice for sight of a whale. Following the whaling season, the clothing could be used for any purpose, but never again for whaling. During the wait on the ice, no fires could be set, and noise had to be kept to a minimum both on the ice itself and back in the village. (In addition to their spiritual importance, some of the taboos seem to have had entirely practical implications.) The crews also could not set up tents, but could shelter behind windblocks made of ice. During these waits, which might last days or weeks, one man at least was always on watch, while the others could relax or sleep. Taboos also applied to the food that the women would bring to the watchers. 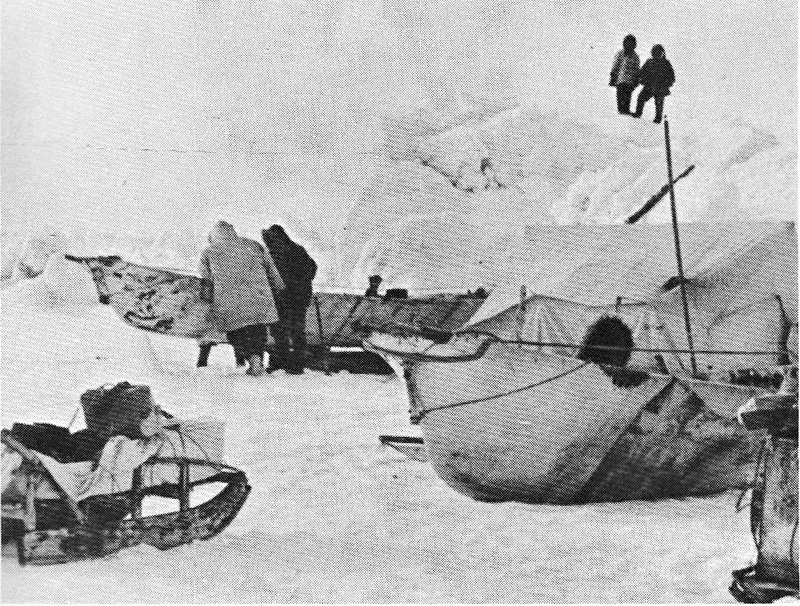 A whale hunting camp on the ice. Note the small dogsled at the left. The photo was taken after canvas tents became available and evidently after the taboo on the use of tents was lifted. The bowhead run lasted from two to eight weeks each year and was followed by a spring celebration and a shift to other prey. Primary source (text and images): Use of the Sea by Alaska Natives -- A Historical Perspective. Karla Johnson. Arctic Environmental Information and Data Center, Univ. of Alaska, May, 1974. The quotation is taken from the Johnson work.